Skipper Pavilion is a stage in Splatoon 2 added in version 4.1.0. It is set in a Japanese-styled pavilion. Unlike most stages, it features lateral symmetry, like Saltspray Rig. Unlike most other stages in the Splatoon series that feature rotational symmetry, Skipper Pavilion's stage layout is laterally-symmetrical. The spawn point is at the top of the map, at adjacent corners. Directly in front of the spawn is a ramp that leads down to a platform, which has access to a raised platform with a large statue and gratings. Downwards from the main spawn platform is another platform with a ramp facing away from the center which leads to a raised platform. At the spawn, on the side furthest from the center, is a walkway that drops off to the earler mentioned raised platform. From the middle platform is another layer, with a ramp leading to a small area and another ramp leading to the main area. The bottom of the center area is large and relatively flat, save for a slightly raised section at the very end. The center has a pathway going up from the far end of the stage, which leads up all the way to the temple, which is large and flat with a pillar in the center. Skipper Pavilion is an Asian-style pavilion off a coast, housing a temple theater that is under construction. The stage is supported by beams, which raises it above water, though players need to be careful as they are still able to fall and dissolve. The spawn area is surrounded with Shōji, or rice paper walls. The very bottom of the stage has a Kansho Garden, with stone paths, small trees and raked gravel. Near the garden are two iron statues of mudskippers with blue accents that parody real-life Komainus. On the edges of the stages are ema boards, which normally have visitors write down wishes and leave the notes on them. On the sides are glass rooms severing as spas and practice ranges, occupied with jellyfish. The spas are decorated with plants and have vending machines, and the practice ranges have mates, targets, and blinds, and is surrounded with shimenawa. The theater houses mats, cushions and display cases, and is supported by pillars covered with tarps. Above is a sign written in Inkling and the platform is surrounded by short wooden guardrails. In the front are two large stone statues, one of a Inkling squid and one of a Octoling octopus, whose bases are covered for construction. Above are two large paper lanterns. All around the stage are construction panels, crates, barriers, grating and tarps which are used as obstacles or platforms the players can use to access more of the stage. The walls in the center are either glass displays and construction tarp, which are uninkable, or wooden boards, which are inkable. In the distance are rock islands with trees, observation boardwalks and a temple surrounded by trees. In the far distance is a city, presumably Inkopolis . The zone is located in the rock garden on the far side of the map furthest from both team's Spawn Points. Several blocks have been added or rearranged in the lower section of the map but the overall layout is relatively unchanged. The layout of the map is relatively the same however a large series of uninkable platforms have been added over the large gaps in the lower area, this area allows access to the upper portions of each team's spawn. The Tower is located on the far side of the map, on the wooden pavilion in the lowest area. From that point, the tower will move besides the lower ramp up one level. After crossing the area it will ascend straight up to the next level, then the goal will be at the far side of that platform. The first checkpoint is located on the first level up from the lowest plaza, in the center of that platform. The second checkpoint is located on the lip of the platform right above the previous area and just in front of the goal. The Rainmaker is located at the far end the map as far away from each team's spawn as possible on the wooden stage. The goal is located at the edge of the same level as each teams spawn point. Ramps have been added between each level to facilitate moving upwards. A slightly protruding path has also been added leading up to the highest level. An entirely new section of uninkable bridges have also been added over the gaps in the lower section of the map to allow more routes of entry. Routes to the goal are very limited on Skipper Pavilion. In Clam Blitz, the baskets are located on the middle layer of each team's side. Two layers below each team's spawn or two layers up from the lowest part of the map. 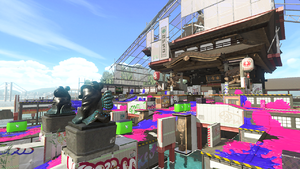 The base layout of the map is similar to that of Rainmaker, featuring ramps between each layer as well as a ramp in the central hallway which allows access to the second highest level of each team's side. However unlike Rainmaker, the additional walkways above the open gaps is not present, neither is the extension to the side of each team's base. Skipper Pavilion has mirror symmetry rather than rotational symmetry, similar to Saltspray Rig and the tenth Shifty Station layout. In Skipper Pavilion statues of old Rainmakers, suction bombs, and several weapons are displayed in several parts of the stage. Skipper Pavilion's name may be a reference to the real-life mudskipper. This is supported by the fact that some of the statues resemble mudskippers in both shape and color. When the stage is brought up by Off the Hook during the 'Current Maps' segment, Marina will sometimes mention that there is a rumour saying that splatting someone between the two large iron statues in the middle of the map will bring "good luck". However, this is not known to do anything yet, and is most likely just in-game lore. During Splatfest, if the player goes into Recon mode, they can hear the traditional version of Calamari Inkantation in the background. Mutsugo Rō Mutsugo Tower. A pun on Mutsugorō, mudskipper. Park «Vo Stok» "Into the Drain" Park, a pun on восток vostok, East.